The Power Boat Guide says "The Mainship 350 Trawler (called the Mainship 390 in 1999–2005) is a stylish, moderately priced coastal cruiser with classic trawler lines and a good turn of speed. Unlike a true trawler with a full-displacement hull, the 350/390 is built on a faster modified-V hull with flat aftersections and a shallow, full-length keel. She’s a very roomy boat inside thanks to her wide 14-foot, 2-inch beam, and the floorplan manages to include double berths in both staterooms as well as a separate stall shower in the head. (Note that the guest stateroom is partially tucked beneath the galley.) Visibility from the lower helm is excellent, and a deck door provides easy access to the foredeck. Aft, a sliding glass door opens to the covered cockpit where a series of molded steps (instead of a ladder) ascends to the extended flybridge. Additional features include deep, well-protected side decks, an integral swim platform, transom door, a full teak interior, and radar mast." 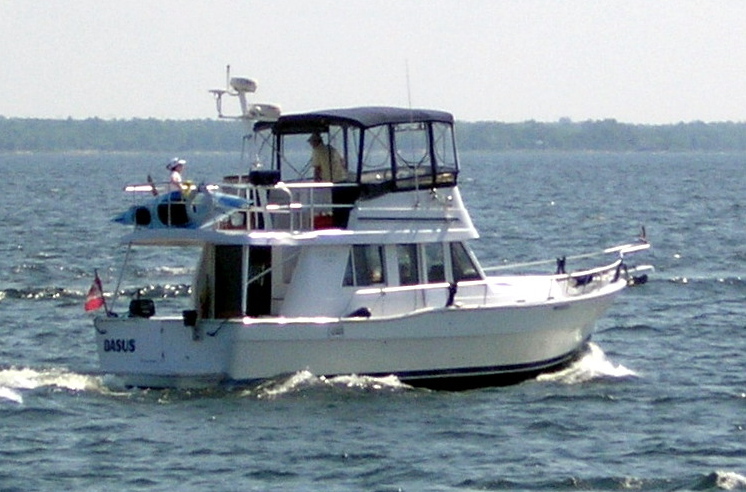 This Mainship 350 has cruised in freshwater only and has been covered-slip berthed on Georgian Bay for the past eight years. The canvas is in excellent condition, and at 1100 hours, the diesels are just nicely broken in. She is accessible for winter viewing. A great buy for anyone looking for a clean, well equipped, coastal cruiser at an excellent price point.